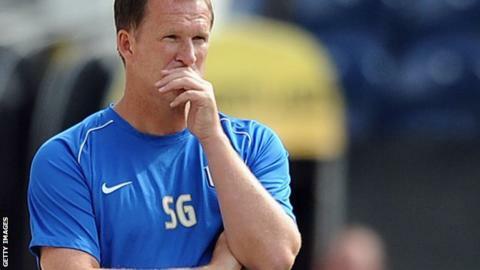 Preston manager Simon Grayson wants his strikers to learn to "relax" in front of goal after Saturday's misfiring display against Colchester. The Lilywhites had 26 shots but only seven were on target in the 1-1 draw. They are a handful for anybody. They are full of confidence and are creating lots of chances. Preston North End manager Simon Grayson on Kevin Davies and Joe Garner. Joe Garner managed to head home one of those chances, while Luke Garbutt converted the U's only effort on goal. "When chances come along they need to relax, do what they can to hit the target and make the keeper work," Grayson told BBC Radio Lancashire. "You just have to reiterate to the players that they are getting those opportunities in the first place and are in the right areas. "There's nothing more frustrating for a manager than when strikers get those opportunities and don't even hit the target. The goals don't move. "You have to make sure that you are very focused and use your technical ability to work the keeper at the very least. "And we did that. Their keeper [Sam Walker] made some good saves at the weekend." Preston's efforts in front of goal were summed up inside six minutes at Deepdale, when Garner's header was pushed around the post by Walker, before former England international Kevin Davies failed to find the mark with a nodded effort at the back post. Despite his side's wastefulness, Grayson is not planning on making radical changes for Tuesday trip to Port Vale. "There won't be any axe wielding around because that won't be the right thing to do," he said. "I do see the bigger picture of what the team is doing and how they are functioning together, and I think the two strikers [Garner and Davies], at this moment in time, are a handful for anybody. "They are full of confidence and are creating lots of chances."